Thomas Oliphant was a son of Sir John (I) Oliphant of Aberdalgie, the then Chief. Sir Walter (IV) Oliphant received the lands of Kellie from a cousin, Helen Maxwell Lady Kellie. These lands were held by the Chiefly line until they were transferred to Thomas Oliphant, 1st of the House of Kellie. The line continued for many generations, even after the land was granted back to the Lord's Oliphant (3rd Lord) in 1562, until the title passed through the sale of Kellie to the Erskine Clan, now Earls of Mar and Kellie. 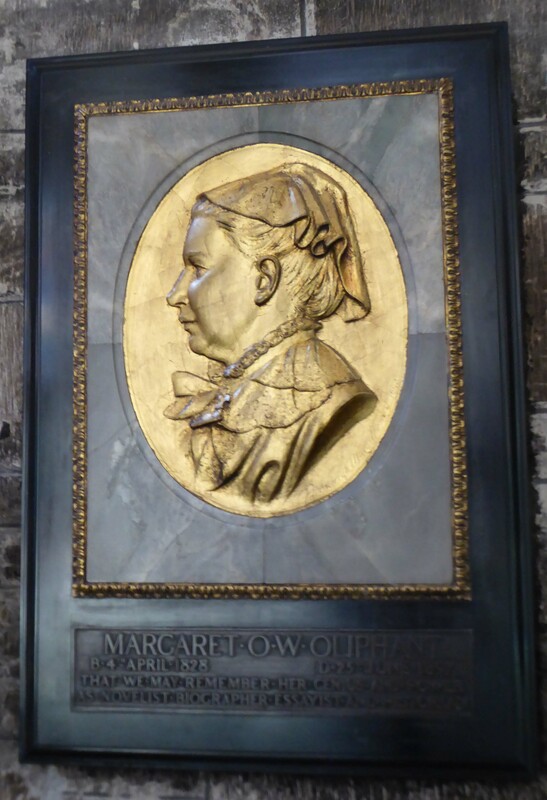 Notable Oliphants of the Kellie branch include author Margaret Oliphant, and her husband, Francis Wilson Oliphant, who was an artist who designed and worked with stained glass (Ely Cathedral has good examples of his work.) There are cadet branches of the Oliphants of Kellie, including the Oliphants of Prinlaws, Murdocarnie (also known as Hillcarnie) Pittotter, Banclero, Prinlaws, Kilmarone, Hattonhill, Over Kellie, Kellie Mills, Freeland and Forgandenny. OLIPHANT, Francis Wilson (1818—1859) painter and designer of stained glass, son of Thomas Oliphant, Edinburgh, of an ancient but fallen family in Fife, was born on 31 August 1818, at Newcastle-on-Tyne, during the temporary residence of his parents there. He was trained as an artist at the Edinburgh Academy of Art. In early life the revival of Gothic style and ornament led him to make a profound study of ecclesiastical art, and while still very young he attained considerable reputation as a designer of painted glass in the works of Messrs. Wailes of Newcastle-on- Tyne. He afterwards removed to London and worked much with Welby Pugin, especially upon the painted windows in the new Houses of Parliament. He also sent in a cartoon to the competition for the decoration of Westminster Hall, which was not successful. During this period Oliphant exhibited several pictures in the Royal Academy, the chief being a large Shakespearean study of the interview between Richard II John of Gaunt, and a striking picture of the Prodigal Son, "Nearing home". In 1852 he married his cousin, Margaret Oliphant Wilson, who was then beginning to be know as a writer, and has since achieved a very wide reputation in many departments of literature. His latter years were occupied with an energetic attempt to improve the art of painted glass by superintending the processes of execution as well as the design, in the course of which he produced the windows in the ante-chapel of King’s College, Cambridge, those in the chancel of Aylesbury Church, and several in Ely Cathedral. The famous choristers’ window at Ely was the joint work of Oliphant and William Dyce, R. A., the former being responsible for the original design. This work, however, was interrupted by ill-health, which obliged him to seek a warmer climate. He died at Rome in October 1859, chiefly from the effects of overwork. He had published in 1856 a small treatise entitled "A Plea for Painted Glass". Oliphant had two sons, both of whom died in early manhood after making some promising efforts in literature. The elder son, Cyril Francis Oliphant (1856—--90) who graduated B. A. at Balliol College, Oxford, in 1883, published in 1890, in the series known as "Foreign Classics", a biography and criticism of the work of Alfred de Musset, which was notable for some well-rendered translations from the French. The younger son, Francis Romano Oliphant (1859—1894) born at Rome after his father’s death, graduated B. A. at Oxford in 1883. He issued in 1891 "Notes of a Pilgrimage to Jerusalem and the Holy Land" which originally appeared in the form of letters addressed to the "Spectator". He was a frequent contributor to that and other periodicals, and largely aided his mother in the preparation of her "Victorian Age of Literature" 1892. Dict. of Nat. Biog. Vol. 42 "Private Information". 1895. Margaret Oliphant Wilson was born 4th April 1828 in Wallyford, Midlothian, to parents Francis Wilson and Margaret Oliphant. A birth record has not been found, even by expanding the search to broader criteria. However in a letter to a publisher, she confirms this date, which had been recorded in her father’s family Bible (per The Autobiography and Letters, 1899, p. 316). Other documentation, including census records, support this date. Margaret Oliphant Wilson was married 4 May 1852 to her first cousin Francis Wilson Oliphant, at St Andrews Presbyterian Church, Birkenhead. A certificate of their marriage is reproduced in the biography by Merryn Williams. Her six children with Frank Oliphant are listed following below. She died 25 June 1897 in Wimbledon, per biographer Merryn Williams. Francis Wilson Oliphant (Frank) – husband of the novelist. Frank was born 28 September 1818 in Gateshead, Durham, per biographer Merryn Williams. Frank was an oil painter, who exhibited five times at the Royal Academy, London. He is better remembered today for his beautiful designs and execution of stained glass windows, such as those in the ante-chapel of King’s College, Cambridge, those in the chancel of Aylesbury Church, and several in Ely Cathedral. Many of his designs, under Pugin, were used in the new Houses of Parliament. Anyone searching for his stained glass works online will find them under “Francis Oliphant”, “Francis W Oliphant”, and “FW Oliphant”. Frank died (of tuberculosis) on 20 October 1859 in Rome, per the cemetery record of his gravestone in the Protestant Cemetery in Rome. 1. 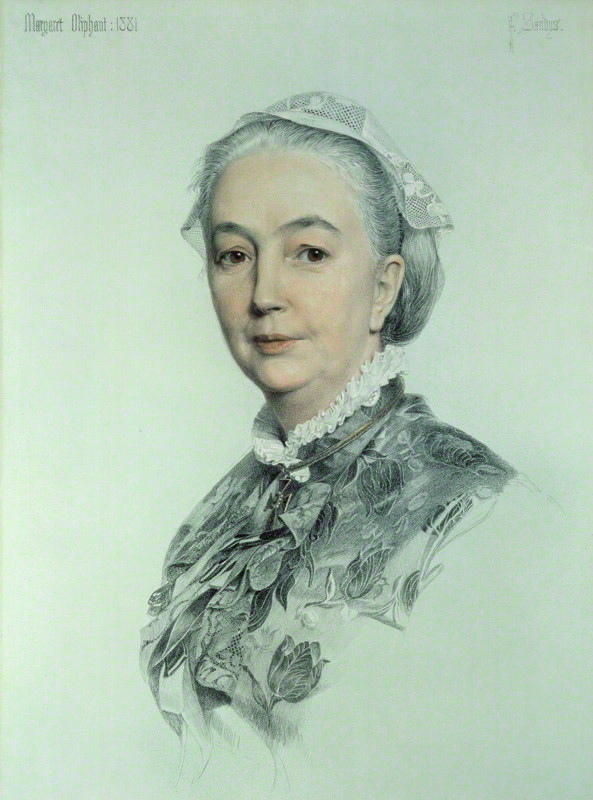 Margaret Wilson Oliphant (Maggie) was born 21 May 1853 in St Pancras London, per biographer Merryn Williams. Maggie died at age 10 (of gastric fever) in Rome, on 27 Jan 1864, per the cemetery record of her father’s gravestone in the Protestant Cemetery in Rome. 2. Marjorie Isabella Oliphant was born 22 May 1854 in St Pancras, and died 8 February 1855 in St Pancras, per biographer Merryn Williams. 3. Child Oliphant (male) was born 21 November 1855 and died same day, 21 November 1855, in St Pancras, per certified copy of register of death. “Son of Francis Wilson Oliphant, Artist (Portrait Painter).” Cause of death: “Premature birth in the eighth month”. 4. Cyril Francis Oliphant (Tiddy) was born 16 November 1856 in Marylebone London, per biographer Merryn Williams. Cyril suffered from alcoholism, weak lungs, and general ill health. He obtained a secretarial post abroad in Ceylon in 1884, but had to return home after several attacks of fever. Cyril died 8 November 1890 in Windsor, per biographer Merryn Williams. 5. [Stephen] Thomas Oliphant was born 25 March 1858 in Marylebone, registered under the name “Thomas Oliphant”, per certified copy of register of birth. Father “Francis Wilson Oliphant”. Mother “Margaret Oliphant Oliphant formerly Wilson”. He died 28 May 1858, nine weeks later, in Marylebone, registered under the name “Stephen Thomas Oliphant”, per certified copy of register of death. “Son of Francis Wilson Oliphant, Historical Painter”. Cause of death: “Open Foramen Ovale” [heart defect]. 6. Francis Romano Oliphant (Cecco) was born 12 December 1859 in Rome, per biographer Merryn Williams. Per the Dictionary of National Biography (his father’s entry): Cecco “was born at Rome after his father’s death, graduated B. A. at Oxford in 1883. He issued in 1891 [the book] ‘Notes of a Pilgrimage to Jerusalem and the Holy Land’ which originally appeared in the form of letters addressed to the ‘Spectator’. He was a frequent contributor to that and other periodicals, and largely aided his mother in the preparation of her Victorian Age of Literature 1892.” Among his contributions was a light-hearted story, Grateful Ghosts, published in Blackwood’s Magazine in January 1886, and reprinted around 1910 in Tales from Blackwood (Third Series, volume VI). Cecco suffered from ill health and weak lungs, which was eventually diagnosed as tuberculosis (like his father). He had wanted a career in heraldry, but was not accepted because of his health. Finally in the last five years of his life, he found congenial part-time employment at the Library at Windsor Castle, usually dealing with matters of heraldry. Cecco died 1 October 1894 in Windsor, per biographer Merryn Williams.